Hale opens his second chapter in this way, confronting the reader with the question—am I being obedient to my call or not? He goes on to distinguish between God’s general call to all believers to carry out the Great Commission and the special call given by God to those who would become missionaries (those who cross cultures in order to share the Gospel. See the last chapter for a discussion of this). This is, no doubt, the question in the back of everyone’s mind when we talk about going to Karamoja—Are they really going to do that? Did God really call them? And the best answer I can give to that last question is, I think so. It may be a product of the experience-hungry culture that, for better or worse, we all live in, or it may be a product of my obsessive need to know that I’m doing the right thing, but whatever the cause, the question of whether or not we are really called to this work is one that I constantly find myself asking. Hale makes the excellent point in this chapter that God controls all things and will, by one means or another, guarantee that we are working at what He would have us accomplish. He writes, “For every person that jumps the gun on God, there are ten more who never get off the starting line.” He further reminds us that we are not called to certainty—we walk by faith, not by sight. All of this forces Chloe and me to ask a further question—Why do we feel that we are called to go to Karamoja? Hale acknowledges that some people have dramatic experiences that make clear to them what their call is. For the rest of us (those of the small-faith and non-pentacostal set), there is a gradual unfolding of God’s will in the form of small circumstances and events that gradually confirm that we are striking out in the right direction. For me, the unfolding has taken several years and many reassurances. The seed was planted in 2006 when I first went to Karamoja to visit Dave & Sunshine. I came away with the overwhelming desire to return, to be a part of the work there. I was, at the time, a college student with little direction for the future and no skills particularly useful to ministry in the African bush. When I graduated from college with a degree in graphic design and began to look for work, I wanted a job that would make for good small talk at parties. A job washing airplanes seemed like it would fit the bill, but when that fell through, I saw an ad for welders at NASSCO shipyard. This also seemed like it would drop well into conversation, and I remembered that Bob Wright had mentioned that there was always plenty of work for welders out in Karamoja, so I applied and landed the job (the interview consisted of the recruiter holding up a sheet of plywood with a manhole-sized cutout and asking me if I’d be willing to get filthy, working in 100+ degree heat and carrying a 50-pound welding machine through a hole that size). Soon after, I got married to a woman who had always wanted to work on the mission field. When I was laid off from NASSCO, I found myself with little extra money and ample extra time and a host of projects to undertake on our house, so I started learning some basic electrical skills, some basic plumbing, woodworking, tiling, and because I chose to go against my father’s good judgement and bought a Volkswagen, I even learned about all the different things that can break down on an automobile. As God would have it, I took Chloe to Karamoja in 2010 and the missionaries there became quite enamored of her. Weeks after we came home, I was offered a job as a web designer, so I began to develop another set of skills that helped to paint a picture of how we might be useful in Karamoja. As it turned out, the missionaries there were very much in need of someone to handle the Mission’s finances as well as someone handy enough to keep the Mission compound in working condition while Bob was away on errands or furlough or work in another part of Uganda. It was also clear to us that the entire work there would benefit from better communication with supporters here in the States. My training and skills in digital communication will hopefully be of use in this respect. Hale makes much of the necessity for a missionary call to be confirmed by others in the Church. No matter how much we perceive our call to be a perfect fit with the Uganda Mission’s needs, we are subject to a church body, and they must sense the call and agree to send us. So we met with New Life’s missions committee and they were supportive of our desire and we have had many people whose incredible generosities have further confirmed God’s call to us. The chapter concludes with some talk of short-term missions (which category our one-year term technically still falls into). 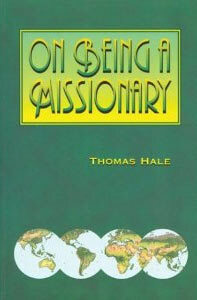 Hale writes about the benefits and costs of short-term missions work, and while it can be a hotly debated topic, he helpfully points out that it can be very beneficial to a work or very harmful, often owing to the selflessness or selfishness of the short-termers’ motives (See Dave Okken’s article here on page 4). As I consider this statement, I realize the debt that I owe to many of you reading. My list of short-term missions trips is not short (and not cheap) and as much as I can look back now and see all of them as stepping-stones to where Chloe and I are today, I can also see that I’ve had my share of mixed motivations. It is truly humbling to consider the great faith and generosity many have displayed in sending me on these many trips, perhaps seeing something in my future that I had never thought a possibility. Talk of missions work always carries the admonition to “count the cost.” There has certainly been much calculation in our preparations, and we hope to always act wisely and follow what we can best discern as God’s will. But we pray (and plead with you to pray as well) that we would be also like Peter, James, and John, who when they were called, were willing to leave everything and run after Christ. May we learn, also, to follow Christ in this way—with the wild abandon of faith. Thanks for sharing the process you have gone through to get to this point. Yes, may we not try to save our life (easy to do, not take the risks but play it safe) and instead lose our life that we might save it. This long distance relationship with the cookies was bothering me.